Your stairs could be as grand as those in the film Gone with the Wind or they could be very plain and functional. No matter how big they are or what their finish is ,every corner of every tread must be vacuumed once a week because it's a dust haven. Before vacuuming, run up and down the stairs several times to dislodge as much dust as possible. It's great exercise. Get the kids to do it! Then, if you have pictures in the stairwells, wipe over the frames with a damp cloth. 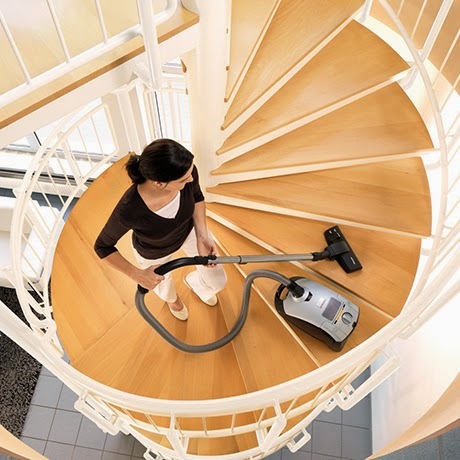 Start cleaning from the top of the stairs and work your way down because dust lifts and drops down. Then vacuum by facing up the stairs, keeping your vacuum cleaner in front of you, and walking backwards down the stairs one step at a time, cleaning each step as you go. That way, your body will stop the vacuum cleaner from tumbling down the stairs and will put less stress on your back. As you vacuum each step, also vacuum between the banister posts with the nozzle or brush attachment. The brass rods, which hold runners in place, need to be polished with bicarb and vinegar on a cloth or just vinegar if you clean them regular. Banisters need to be dusted and polished according to what they're made of. Clean brass with vinegar and water applied with a cloth. Aluminium is cleaned with cold tea applied with a cloth. Clean steel with vinegar and water applied with a cloth. Painted metal or plastic can be wiped with a little detergent and water or vinegar on a cloth. For French polished timber, use beeswax, lavender oil and lemon oil applied with a cloth or you can also use a good non-silicone furniture polish. Quick tip: to create the lavender oil, lemon oil and beeswax cleaning cloth, get a microwave-safe bowl. Place a cleaning cloth in the bowl, then add 1 drop of lavender oil, 1 drop of lemon oil and 1 tablespoon of beeswax to the top of the cloth. Warm in the microwave in 10-second bursts until the beeswax melts. The cloth will be impregnated with the mixture and is ready to use. Store it in a zip-lock plastic bag. Special attention should be paid to the end of banisters because lots of people grab them with their hands and leave messy finger marks. Make sure you remove all the marks. Wipe between the banister posts with a cloth that's been wrung out in water. Then vacuum underneath the stairs. If the stairs are wooden, vacuum and then wipe with a mop. I prefer to use a broom, which has its broom head wrapped in an old T-shirt dampened with vinegar and secured with an elastic band. Speed up your cleaning by making sure extension cords are long enough before you start vacuuming. How many times have you nudged into a corner thinking the cords would just make it and then lost power? You then have to walk all the way back to the power point, add an extension cord and resume your cleaning. It's a time waster! So sort that out before starting the job. I also use a protector to cover the joins of extension cords so they don't scratch the surface of things. If your stairs are carpeted, make sure the carpet is tight and well fitted so that dust havens aren't created. Get free carpet cleaning quotes from accredited Auckland carpet cleaners today.